Dastardly villains have captured the governor's daughter and it's up to you to save her. Employ merchants to trade goods, or use your pirates to sink your enemies and steal their treasures. Barter or blast your way to victory! In Black Fleet, players employ their pirates, merchants and occasionally, the Royal Navy to trade for gold and sometimes just take it. Every turn you will play a movement card to determine where and how you can move and what you can do when you get there. 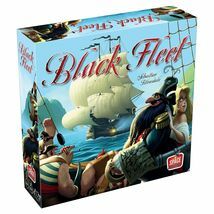 Swashbuckle your way across the Caribbean and rescue the governor's daughter from the Black Fleet.